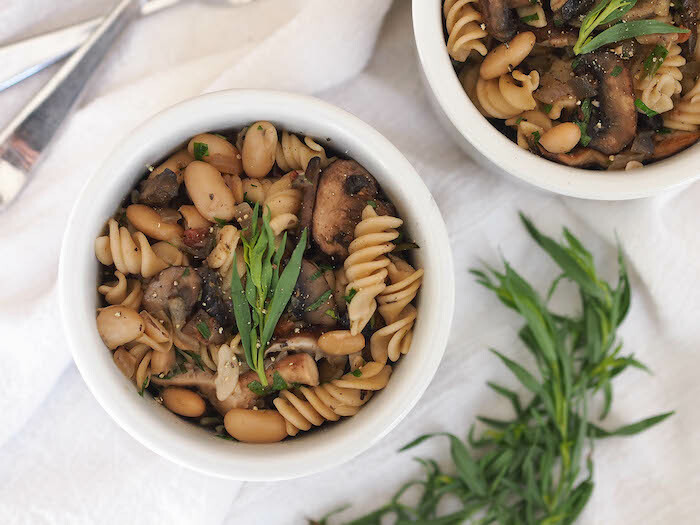 This simple mushroom and white bean pasta recipe is a quick and easy meal, even for those who lack major cooking skills. This Tuesday I gave a presentation to a group of physical therapy students on collaborating with dietitians in the healthcare environment. Listening to them talk before class was making me super nostalgic for college. Err, that is until their professor started talking about finals next week and then I was like NOPE. During question time at the end, a few students asked general nutrition questions, most of which centered around how to cook easy and nutritious meals. Ahhh college, the land of ramen noodles and late night fast food. Being not that far removed from college (humor me), I totally remember the challenges that came with learning to cook those first years I was living on my own. My advice, for not only college students but for anyone who is trying to cook more at home - keep it simple. In the food blogging world, healthy food is always beautifully styled, balanced and often cooked from scratch. We create dishes that look good, so you want to click on them, share them, pin them, and hopefully, cook and eat them. It's part of the business. Sharing creative, sometimes complicated, and beautiful food helps me get work with brands and helps me reach the private clients who need my help. But in reality, there's a lot of nights I throw some crap on a plate and call it a day. Some nights I eat canned Indian food, which is waaay yummier than it sounds (Jyoti is the best!). Other nights I dig through the freezer and microwave something soupy/stewy looking that I froze weeks ago without being 100% sure what it is. It's like the adult version of those mystery flavor airheads. Eating at home doesn't have to be complicated. Learn a few simple cooking methods or basic recipes, then experiment with spices, herbs, and different condiments. have to be complicated. For example, if you know how to make basic roasted chicken and vegetables, you can make a fall roasted chicken with brussels sprouts, butternut squash and cranberries, an Indian roasted chicken and vegetables with cauliflower, sweet potatoes, curry and a storebought chutney, and Mediterranean roasted chicken and vegetables with white potatoes, canned artichokes, tomatoes and oregano. Cooking at home doesn't even need to involve real cooking. Microwave meals are perfectly appropriate, as long as you bulk them up with sides to make it a big more filling. I'm a big fan of Luvo - one of my clients - and Amy's. When I was in college, mushroom pasta was my go to. Every time I went home, my parents would pick me up a HUGE bag of dehydrated portabello mushrooms from Costco. I would rehydrate them in warm water, saute with olive oil, onions and garlic and add that to pasta with all the parmesan cheese. 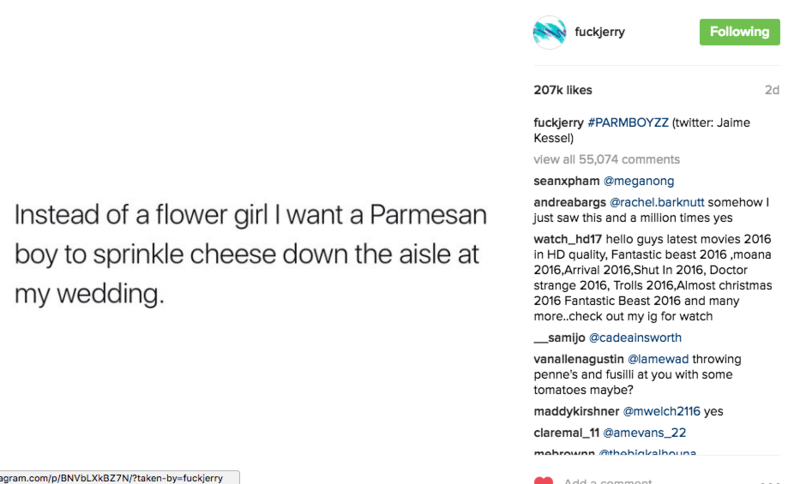 Sidebar: Speaking of parmesan cheese, I ran across this on instagram the other day and just about died because YES! This recipe for mushroom pasta is kind of an upgraded version of the one I used to make in college. Fresh mushrooms. Pancetta. Lotsa garlic. Fresh herbs (which weren't in my college kid budget.) If you'd like to add in some more protein, try crumbled tempeh, or the tempeh sausage I use to make these stuffed mushrooms, chickpeas, or leftover chicken. Bring a large pot of salted water to a boil. Add pasta and cook according to package instructions until al dente. Heat pancetta and olive oil in a large skillet. Saute until crispy, about 3 minutes. Add onion and garlic and saute 5 minutes until translucent. Add mushrooms and saute until tender, about 10 minutes. Add broth, simmer a couple minutes, then add pasta and white beans. Season with salt and pepper. Stir in fresh herbs. Serve.